Well, yeah. I've been gone for too long. I am the title of this entry. Life has been very busy lately and I just couldn't find time to update my blog. I have also been thinking 'bout lots of things. Gawd! And I mean A LOT! That's all for now. I just want you to know I still exist... and by the way, I miss you too. 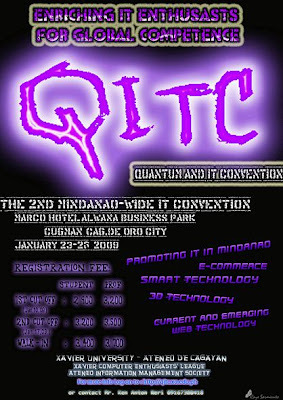 I will not be online from January 22-24 because I will be very busy with the Quantum and IT Convention. I am actually one of the staff so just imagine how busy being one is. We are all so excited yet nervous! We are expecting 150+ delegates from four different schools in Mindanao. We hope this will be a great success! What are you doing, making me fall in love with you? What was it trying to say? What happened to the things you once told me? Unfortunately, yes. You still do. Boracay is one of the places I wish to visit here in Philippines. It's actually a very famous tourist spot. It seems that Cagayan de Oro City is having a bad start this year. Just last January 3, the Cagayan River raged and greatly affected residents nearby. Eight days after, almost all parts of the city were submerged due to constant heavy rains. We thought it was the worst. But we were wrong. Two days after, flash floods hit the city and more areas were affected. Thousands of people are still suffering because of the disaster. Many have lost their homes. There were also people buried alive due to landslides. The classes were also suspended this morning (which is the only good thing about having flash floods)... Anyway, here are sample pictures taken by two of my friends. I have read from the news that the floods were caused by the tropical storm "Auring" and the continuous cold front. I never expected these things to happen here in CDO. I never expected it would be this worse. When I listen to the radio, all I hear is bad news. Floods here, landslides there, victims everywhere. Although I still thank God that we are safe here at home, I just can't help but worry and feel helpless about those thousands of people affected by the calamity. I just hope everything will be alright soon. Please help me pray. So this is my first post for this year. As of the moment, I only have one thing to share with you. And that is all about having a new look. Me and my sister had our hairstyle changed last January 3. She got her formerly straight hair curled, and I got my formerly curly hair straightened. Cool, isn't it? We swapped hairstyles on the same day but in different places (she's in Singapore, I'm here in the Philippines). *laughs* Anyway, here are pictures for you to see our new hair for the new year.